Type AB blood is rare, population Roughly 4% of the world is AB +ve and 1% AB -ve. John F. Kennedy and Marilyn Monroe are two famous people in blood AB population. 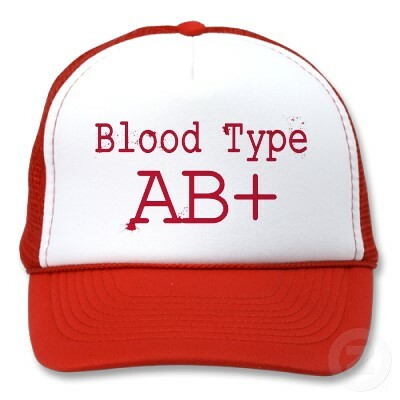 AB is the newest of the blood types. Until ten or twelve centuries ago, there was no Type AB blood type. Type AB resulted from the intermingling of Type A with Type B. Type AB is the only blood type whose existence is the result of intermingling rather than environment. Thus, they share both the benefits and the challenges of both Type A and Type B blood types. Type AB has a unique chameleon like quality – depending on the circumstances, this blood type can appropriate the characteristics of each of the other blood types. Type AB is sometimes A-like, sometimes B-like and sometimes a fusion of both. Not surprisingly, ABs can be quite dualistic, possessing both A and B traits. You may be shy and outgoing, and hesitant and confident. Blend of opposites. Introvert and Extrovert. Unpredictable and may seem to have calm exterior. Strong creative strain. Good at spotting problems and skirting them. Everything they do is compelling. Never take things for granted. Appear mysterious. Contribute harmoniously to society. Your patience, concentration, and intelligence are admirable. AB can find a soul mate with any other blood type. Blood Type AB – Tend to be very charming and popular. They don’t sweat the small stuff and can be seen as spiritual and even at times a bit “flaky”. Don’t like labels, and are nice and easy going. You are logical and determined to do things correctly. Traits Social, Easy-going, Sympathetic, Diplomatic, Outgoing, Laid-back, Creative, Unpredictable, Artistic, Flexible, Moody and Brooding. There is never a dull moment in a AB’s life, so if you find one for a friend, consider yourself lucky! Youll enjoy some exciting times together! Sometimes it is difficult to be an AB. AB’s don’t like to fit in anyone else’s “boxes”. If they feel too confined, they’ll break out of that box and do things their own way. bartender? lawyer? teacher? sales representative? and social worker?